This is the draft of the script for my next video in the Law of Value series. I am posting it because I would love to get feedback, criticism, suggestions, etc. before I start making the video. I am particularly interested in people’s opinion of the “3rd thing” argument: of the argument that exchange-value implies the existence of an intrinsic value that is being expressed through exchange value. I want to make sure that this is a logically rigorous presentation of the argument and that it is simple and clear. Any thoughts? This is one of many abandoned houses in my neighborhood. The slumlord owner let the property deteriorate until it became unlivable and doesn’t want to pay the money to make it livable again. There are thousands of abandoned houses in this city, and thousands of homeless people. Despite the urgent social need for houses these properties don’t fulfill a social use. Why not? Because the owners of these commodities are not interested in their use. They are interested in their exchange-value, the rent they receive from the property. For decades they collected rent while the use-value of the house deteriorated. And now these houses sit vacant, a testament to the contradiction between use-value and exchange-value. This is not a contradiction restricted to housing. Every commodity contains this contradiction because every commodity is produced in order to be exchanged, not in order to be used by the producer. We have enough food on the planet to feed everyone, yet millions starve. Why? Because we don’t produce food directly for social need. We make food in order to sell it for money. Society has much of the technological ideas it needs to reduce greenhouse gas emissions, yet it isn’t acting fast enough to apply these ideas. Why? Because production is not undertaken to directly mediate our relation with the environment. We produce for profit. The exchange of the products of labor in the market is just one of many possible ways that the private labors of billions of individuals can be coordinated. Some people think this is the best possible way to coordinate human productive activity. Marx saw that, despite all of the dynamism and technological wizardry of capitalism, there were fundamental social antagonisms at the heart of this means of coordination… that, if left to itself, production for market exchange led to all sorts of unexpected consequences including gross inequality, exploitation, and crisis. If we are to learn how this coordination works we need to start by analyzing these two sides of the commodity: its use value and exchange value. A commodity has a use. This is its use-value. What does use-value tell us? It tells us how a commodity satisfies a social need. If we want to feed everybody we need a certain quantity of food. If we want to build everyone a house we need a certain quantity of wood and nails. Some use-values require no effort to attain: air, sun, gravity, etc. Others require effort to attain. There is a finite limit to the amount of labor that can be devoted to the production of use-values. Society must apportion this labor between the production of different use-values in some way. As technology changes the amount of labor required to produce some use-values decreases thus signaling a change in the apportioning of labor. As technology evolves to reshape what human labor is capable of producing so do our needs and desires evolve. In different societies this labor is apportioned by different methods. In a market society it is the buying and selling of the products of labor in the marketplace that serves the purpose of allocating labor between the production of this use-value or that use-value. This creates a second type of value, unique to market societies: exchange-value. Exchange value is the ratio in which one good exchanges for another. Perhaps one book exchanges for a loaf of bread… Or a new car exchanges for a thousand bottles of whiskey. These ratios are all exchange values. They say a book is worth this much bread; a car is worth this much whisky. In a developed market society one commodity eventually emerges as the primary commodity in which all other commodities express their exchange value. This is what money is. For most of the history of capitalism this commodity has been gold. By comparing the ratio of tomatoes or cars or baseballs to gold all commodities measured their exchange value in ratios to gold. You can’t use it AND exchange it! If I am selling a tomato this tomato has no use-value at all for me. Its use-value only exists for the person that buys it. I am only interested in the exchange-value, how much money I can get for it. Production in a capitalist society is not production for use, but for exchange. This means that we have no inherent interest in the usefulness of our labor outside of its ability to create exchange-value. Now, from a social perspective, it is very important what kind of labor we do: Do we make bombs or flowers? Oil or cupcakes? But as individuals we have no stake in this. We produce in order make money, to get exchange value. Bourgeois subjective value theory talks about a “double-inequality of exchange.” It says that the only reason exchange happens is that two people value the other person’s product more than the product they are giving up. Marx actually goes even further than this. He says that to the seller the commodity has no use-value at all other than the fact that it can be exchanged. Not only does this bourgeois theory of “double-inequality of exchange” give the mistaken impression that people produce for their own wants and then sell off the surplus in the market, but it also imposes the profit-maximizing logic of the capitalist onto the consumer. By claiming that consumers make a subjective profit from exchange it transposes the real, objective profit of a capitalist who pays his workers one sum of money and sells the products of their labor for a greater sum of money, onto a completely intangible and unquantifiable notion of subjective profit. But subjective preferences for commodities can’t be measured, divided, added to, or compared in a numerical fashion. By imposing the logic of capital onto consumers it effectively erases class from the scope of its analysis. One book= a case of beer. What does that mean? What does it mean to say something is worth so much of something else? We can’t compare uses yet commodities are compared with each other all the time in the market in the form of exchange ratios. That’s what exchange value is: a comparison of the value of one commodity to the value of another. When I say that a book is worth a case of beer I am expressing the exchange value of the book in beers. The book is worth six beers. But a book can have an infinite amount of exchange values. A book can form an exchange ratio with toothbrushes, beans, kittens… anything. Each of these exchange values is just another way of measuring the exchange value of the book. But this means that the book has a value independent of the particular commodity that we choose to measure it with. Whether we measure the book’s value in beers, beans or kittens it stays the same. The only thing that changes is the “form of appearance” of this value- the particular manifestation of this value. This independent value is a real thing, implied in the very notion of exchange-value. Marx uses the term “intrinsic value”. By this he doesn’t mean that value lies buried within the commodity, or that it is magically bestowed upon the commodity, but that it is impossible to compare commodities to each other in the market without a commodity having its own value. Over time one commodity emerges as the primary commodity that all other commodities measure their value in. This commodity is money. Money can trade for any commodity and thus becomes the universal measure of the intrinsic value of different commodities. What is the 3rd thing? We have seen that exchange value implies that commodities have an intrinsic value expressed in different exchange ratios. This value is not use-value or exchange-value but a 3rd thing. But what is this value? Where does it come from? We have already seen that it can’t come from use-value because use-values are not comparable and use can’t be measured in any quantitative sense. The logical place to look is the very place that we began our investigation of human society: with the creative power of human labor. Society is not something imposed upon us by nature or some divine power. It is the product of our own creation, of our creative action in the world. The study of society is the study of the organization of this purposeful action. In a capitalist society this creative activity takes the form of commodities. The relations between laborers take the form of commodity exchanges. Labor takes the form of value. (Issac Rubin suggests that instead of calling it a labor theory of value we might better call it a “value theory of labor”) When we say a commodity has a certain amount of value we are saying that society has devoted a certain amount of its labor time to the production of that commodity. So when before we said that there was an antagonism between the use-value and exchange-value of a commodity, not we can refine this to say that a commodity has an antagonism between its use-value and value. Exchange value is just the way we express value. Remember, we can’t directly see the relations between workers. We don’t have a direct way of seeing how much labor has gone into a commodity. We only see the relations between commodities, relations called exchange values. Exchange value is the way value is expressed. In his famous critique of Marx, Eugene von Bohm-Bawerk argued that Marx’s argument that labor creates value was unjustified. He said that there are many other things we could posit as this “3rd thing” behind exchange-value and use-value. Why not color? Weight? Scarcity? Utility? Marx had no logical justification for holding labor above other common qualities of commodities. Yet Bohm-Bawerk’s criticism misses the entire point. If Marx’s goal was to play intellectual parlor games then perhaps it would be fun to theorize about a color-theory-of-value or a weight-theory-of-value. But Marx’s point was to explain the social relations that make up a capitalist society. Identifying labor as the substance of value is the only logical choice if we are to explain the organization of human activity through commodity exchange. 1. In a capitalist society we don’t produce for immediate use. We produce to exchange. 2. The products of our labor become commodities in the market with both use-value and exchange-values. 3. Exchange-values are ratios of how much of one commodity exchanges for another. Exchange value implies that there is a 3rd thing, an intrinsic value that is being measured by this or that exchange ratio. 4. This 3rd thing is social labor. When Marx says “value” he is not talking about subjective preferences, or even price. He is talking about labor-time. Value is labor-time. Price is the way we measure value. Subjective preferences are shaped, in part, by this world of commodity values. Not only is this the best starting place for an analysis of society, it is also the best starting point for a radical social theory whose aim is to investigate the possibility of changing the world. If we realize that human society is not the result of some natural or divine eternal logic but merely the creation of our own labor then that means that we have the power to mold and shape that society as we see fit. In a capitalist society these creative powers take the form of an external world of value and capital that acts back upon society, shaping it against the will of its creators. Yet, in the end the world of capital is nothing but the product of our own creation. If we truly want to change the world it is not up to nature, God, fate or experts, but up to us. This is the radical challenge of the law of value. 1. There have been attempts by neoclassical economists to reduce the usefulness of commodities to some common substance. Since there is no common substance that makes up usefulness they have to make up an imaginary substance called “utles”. These economists actually say things like, “A cup of coffee has 13 utles and a car has 3000 utles of utility”. But such attempts to invent imaginary substances with which to reduce utility to are generally thought to be pretty silly and misguided. In neo-classical economics this concept has been mostly replaced by the concept of rank preferences, or graded utility: A consumer has a ranking of demand preferences but these can’t be reduced to some common scale. In this way the question of value, in the sense that a commodity has a definite amount of value as determined by subjective social demand, is mostly abandoned: Commodities don’t have values, but consumers have preference rankings and these preference rankings result in prices. This approach conveniently eliminates many of the theoretical problems with earlier marginal utility theory (namely the unquantifiable nature of subjective utility), yet it an inherent circularity: consumer preferences are not formed in a vacuum. They are formed on the basis of preexisting exchange ratios. As the prices of commodities change so do the preference rankings of commodities. The pink elephant in the room is the productivity of labor. As this productivity changes so do prices. There are a host of other criticisms lodged at Marginalism by marxists. Perhaps sometime in the future I can write/produce more on the topic. This entry was posted in The Law of Value and tagged 3rd thing, commodity, contradiciton, draft, economics, exchange-value, law of value, marx, use value, utility, value. Bookmark the permalink. I don’t think that Bohm-Bawerk was playing a parlour game but I’m still struggling with his critique so can’t be helpful yet. Have you read Hilferding’s reply to B-Bawerk? I suspect you need to strengthen the B-B section, eg. Not really because the clear separation of use value and exchange value is done on the basis of any society not just capitalist society, ie. the separation establishes a clear abstraction to start from. In capitalist society use value does effect exchange value. This is a difficult one as Marx did distinguish between use-value, exchange-value and value, seeing exchange-value as an expression of “value” defined as the socially necessary labor embodied in a product (or the socially necessary labor-time taken to produce it from start to finish) in a society in which products were produced to be exchanged. The danger to be avoided is the suggestion that this “3rd thing” is something physical that would exist in a society where goods were not produced for sale but directly for use, whereas in fact it too is only the form that (socially necessary) labor takes in a production-for-exchange society. Value in Marx’s sense is a social not a physical category that won’t always exist. Also, in a text entering into such detail, I think that a distinction should be drawn between “labor” and “labor-power” (I think at one point you say that the workers sell their labor — they do in the popular sense but not in the sense that the word is being used elsewhere in your text). This could be interpreted that with outside interference (from a government?) production for market exchange would not lead to these consequences, whereas, even with outside interference, it still has (and has to). I think your points about “labor power” and “if left to itself” are good. I’ll make those changes. Regarding value, are you saying that my text gives the impression that value is not a social relation? Do I make it sound like a physical thing? re jobs and satisfaction. Obviously it is theoretically possible for an individual to find subjective satisfaction in any type of work. Yet I think a critique of the capitalist labor process needs to be more than just a critique of exploitation. Producing for exchange disciplines the worker to external pressures (the law of value) that continually reshape the labor process in a way that is increasingly alienating, robbing the worker of control over work, making it increasingly difficult to find real satisfaction in work. So, I think that is really important to emphasize that social movement to abolish capital is also a movement to re-conceptualize the nature of work. Actually, I was planning to go into this in more detail in my video on Abstract Labor. Because of the limited time, I have broken these topics into separate videos. Any society in which the dominant mode of production is production for exchange is a capitalist society. I agree that use-value effects exchange value. How do you think it would be best to explain the effect of use-value on exchange value when making the 3rd-thing argument? I agree that work needs to be reconceptualised along the lines you suggest but also given the centrality of labour to marx and engel’s development of humans (“the part played by labour in the transition from ape to man”) that it is a mistake to give the black and white impression that work is totally alienating and consumption is the sole source of satisfaction. I don’t think I’m exaggerating, your sentences are saying that (“Our job is not a means toward personal satisfaction. Our job is a means of making money so that we can buy our satisfaction in the market. [image of buying beer or entertainment. focus on gluttony]”) even though you are satirising, with the bit in square brackets the consumption side as well. 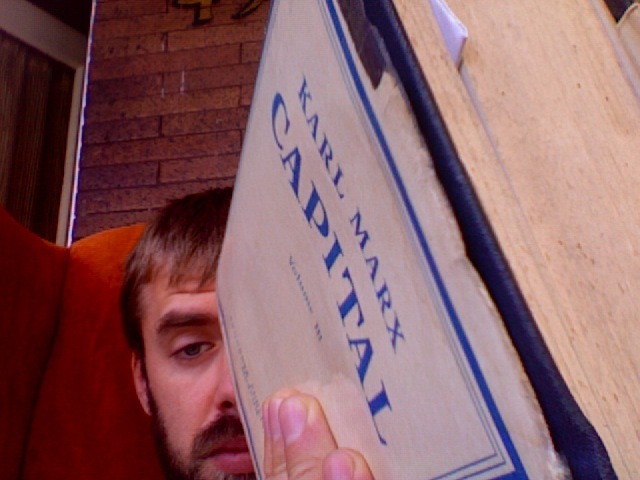 I’m reading Capital for the first time and one of the standouts is the extensive focus by marx on the horrific working conditions at the time he wrote and the way he links that to the compulsion of capitalists personified with respect to the extension of the working day, the division of labour and the introduction of machinery. But nevertheless because of the trade union movement and for its own survival capitalism has in industrialised countries had to accept say a 40 hour week in many industries and aspects of the welfare state, etc. Perhaps with globalisation many of the worst jobs have been exported from the metropolis, the nike sweatshops in the developing world, etc. Clearly capitalism would not have survived if it had not adapted in these sorts of ways and there was an ebb in the revolutionary movements that did occur in marx’s time because capitalism did adapt. On a personal note I have spent years of my life teaching for a job and obtained much joy from it as well as much alienation from having to deal with the bureaucracy. It’s really the demonstration of inherent capitalist instability as revealed by the latest economic crisis (it took that to make me realise how deep the fragility goes, that marx could well be right) that has brought me back to reading marx; rather than being ground down and totally alienated from my job, especially since I chose to work part time. Modern capitalism provides all sorts of niches for people to slot into, people who would otherwise become totally pissed off and join the revolution. I was wrong about the distinction I made about use value and exchange value. I reread that section of Capital and Marx does say clearly that exchange value develops in capitalist society (“Use values become a reality only by use or consumption: they also constitute the substance of all wealth, whatever may be the social form of that wealth. In the form of society we are about to consider, they are, in addition, the material depositories of exchange value”). Sorry for wasting your time there. I’ll try to answer your question (final sentence) after doing some more reading. After writing to you I reread parts of Chapter One of Harvey’s “Limits to Capital”. I’m thinking now that that is the best modern analysis of value that I have seen, especially the way he provides for further reading through footnotes. I looked up how Böhm-Bawerk referred to color in his critique of marx. It’s just a footnote (here) as part of a discussion of bigger point he is trying to make, that Marx arrived at his labour theory by a purely logical argument of elimination and not by a positive proof. Harvey argues that it’s quite a complex issue to answer why land, wood in trees, water power for example is not part of value. Although you have the correct answer (“Marx’s point was to explain the social relations”) I think you might have trivialised Böhm-Bawerk’s argument. If I remember correctly, Eugen von Bohm-Bawerk’s argument was that commodities are not only products of labour, they are also appropriated, scarce and subject to demand. BB argued that these could also be used to explain value. But these properties of commodities are relations between people and things, whereas Capital’s analysis at the beginning of chapter one is the commodity itself in isolation. So, taken by itself and abstracting away from everything else, the commodity, the cell of capitalist society, is a product of labour, and that is a property of the commodity itself, whereas its status as something scarce or appropriated or demanded refers to the relationship between people and the object in question. No, I don’t think your text does suggest that “value” is a physical thing. It’s just that there are some in the Marxist tradition who do argue that “value” could exist on its own withour “exchange value”, ie that “value” will/would continue to exist in a society/economy which did not produce for market exchange. Note that Marx was arguably one of those people. Having uncovered the basis of value as social labour, following classical political economy, he suggest a conscious allocation of goods using labour-time accounting. This is clear both from his brief example in Vol.1 and his Critique of the Gotha program. Dave, what is the example in vol. 1? In terms of the GothaKritik, this is a transitional society with labor certificates. In later stages he discusses from each according to his ability to each according to his need. Either way, do you think labor certificates are the same as a law of value? This is the same example he gives many years later in his comments on the Gotha program. Since I take the somewhat ambiguous term ‘law of value’ to mean the unconscious allocation of social labour through market prices and market exchange, I do not think that a system of labour credits advocated by Marx above would be the same as the law of value. The point I’m making is that in a highly complex economy with fundamental ecological and human (i.e. labour) constraints requires forms of accounting for planning and allocation purposes. Labour-time accounting proposed by Owen and Marx does provide such means. Bill said: I don’t think I’m exaggerating, your sentences are saying that (“Our job is not a means toward personal satisfaction. Our job is a means of making money so that we can buy our satisfaction in the market. [image of buying beer or entertainment. focus on gluttony]“) even though you are satirising, with the bit in square brackets the consumption side as well. Bill, I think Brendan was simply referring to the fact that there is a division of labor at the production end in Capitalism where the workers don’t produce anything of their own (only commodities) where in other market societies people produced and “satisfied” their needs (for apples or socks) for themselves first and then sold off the surplus. They owned the apples and socks and sold the rest.